I recently had the privilege of volunteering for AZ Dental Mission of Mercy. I found this to be a profoundly powerful experience and wanted to share a bit of it with my patients. The Arizona Dental Mission of Mercy gathers volunteers in helping treat 2000 people with dental needs that can’t be fixed by themselves. So who exactly was there to provide their services? All volunteers providing dental treatments must have all appropriate and active licenses issued by the appropriate licensing authority to provide treatment. All other volunteers must agree to a cursory background check to volunteer for the CADS MOM project. It’s a huge undertaking and requires quite a bit of coordination. 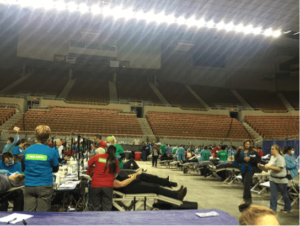 The AZ Dental Mission of Mercy (CADS AZMOM) volunteer event utilizes 100 portable dental units and requires over 1,500 volunteers to make this event occur. Their first three events changed the lives of so many people. 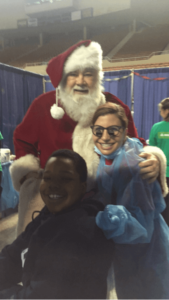 300 dentists, including pediatric dentists, along with dental assistants and dental hygienists were able to treat 1,700 patients and provide $1.8 million in free dental care over the two-day period in 2014. The CADS AZMOM events are considered to be the largest charitable dental clinics ever held in Arizona. In 2015, their emphasis was on basic dental care such as fillings, extractions and cleanings. Limited lab work (i.e., stainless-steel crowns for children, treatment partials) were also offered. Arizona residents suffer from higher rates of dental disease and benefit less from proven preventative methods than other states. A recent survey revealed that 21% of Arizona adults and 31% of Arizona children have never had a dental check-up. The good news is that most oral diseases are preventable. I was very honored to be a part of this event, and look forward to volunteering again in the future. If you want to learn more about this event and volunteer opportunities, please visit https://www.azmom.org/.